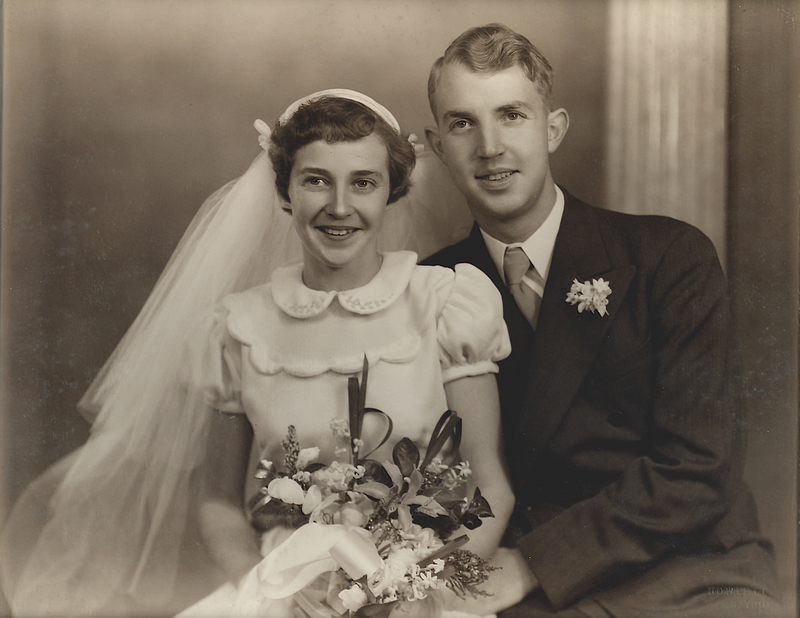 Kathleen Kenny and Gerard Leahy married on 21 June 1952. The start of a day’s dialysis at home. Kathleen Kenny was born in 1928 and I came along in 1930. My first 20 years medically were pretty uneventful. Our families had been friends for many years. Kathleen’s father died a few years earlier and with later experience, they think from renal failure. There were 10 children in the Kenny family with the youngest 5 years old and 9 in mine, with me the youngest and now only survivor. We setup home on a property near Tumbarumba on the western slopes of the Snowy Mountains. It took us many years to produce 2 boys and 2 girls.When our two girls were quite young one of Kath’s many sisters, Lippa who was living in England, suffered kidney failure. Another member of Kath’s family, Babbity (Babs) offered one of hers. After all the checks, which are a bit more complicated across the world, comparability was OK. Lippa had 2 young girls at this time so Kath and I decided to travel over with Babbity to look after the family. Lippa’s husband John worked for a local bank and they offered to pay her air fare. At the time there was a special first class round the world air fare, so we took it up for the first and only time. We flew to Rome and took the scenic route through Europe using Europass to travel on trains and ferries for a week. The operations took place in the Canterbury Hospital south east of London. When things had settled down, after our visit to see the girls in hospital, John took us and his 2 girls down to Dover and on the ferry to Boulogne for lunch. Then he purchased a couple of dozen French duty free wines, which he put in the stroller, his younger daughter on his shoulders and we retraced our journey home. Eventually Babs had recovered sufficiently after her operation and we returned home via the US, taking in the New England autumn colours. Lippa was able to bring her family back to Australia, which she had hoped to do before her kidney failure. Her new kidney eventually failed and she had another transplant. She eventually died 10 years after the original transplant, but had seen her girls grow up to teenagers. In my forties I was struck with a bad bout of rheumatoid arthritis and was told by my doctors it was not compatible with farming, so I sold the property and we moved to the Blue Mountains, as we feared Kath eventually may need access to a major hospital. The percentage steadily declined requiring Kath to start dialysis, first at RPA in the old ward, then new ward and finally training at Dame Edith Walker’s old home. 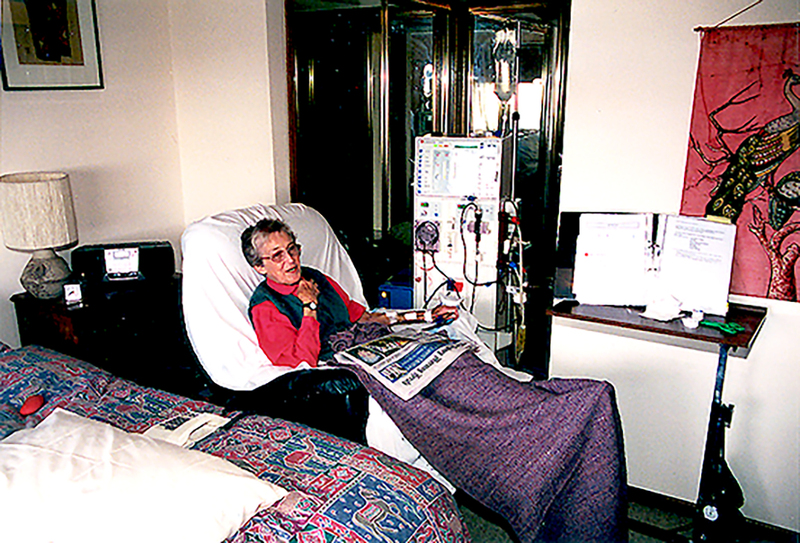 Eventually we masted the haemodialysis machine and the system was set up at home. Kath said, with past family experience, she would not have a kidney transplant. Now with our first home dialysis, carefully watched by our tutor, we were on our own. But to cope, we had an instruction book the size of an ancient bible, Kath had mastered cannulation, my practical experience with farming machinery, and a phone number to ring; away we went, until our 4th session! An alarm went off which we had not heard before and I could not find in our bible. On the phone to the technician I explained the problem. Not long after the front door bell rings and in he marches with a box under his arm. He explains it is a very unusual problem, but the blood pump has packed up. He slips another one in and we were able to finish the session. When I ask him does he have many unusual problems he tells us the story of a continual hot water alarm after a machine was installed at Lightening Ridge. After consulting the locals they suggested a Temprite machine as used to cool the local beer. After the locals found the money, they purchased a machine and solved the problem! Another occasional mishap was the loss of power, so we purchased a petrol engine driven electric generator which solved this intermittent problem. After 3 years dialysing at home, one morning after setting up the machine and starting the 5 hour session, Kath announced she was going to bid for a kidney transplant. Now, in spite of her earlier statement, this did not surprise me. We visited our appointment at the pretransplant clinic and after the bevy of renal physicians and surgeons had a look at Kath, they decided she was a suitable candidate. I then asked how long she might have to wait and we were told it could be 3, 5 and one patient had been waiting 18 years. I was then told, in answer to my question, what the compatibility requirements were. We were then in the middle of a rare domestic about my possibility of donating a kidney when the nurse arrived to set up appointments for Kath. She was quite amused at our antics and suggested I should ring her and she would make the appointments for me as well, if we ever resolved the argument I thought that all that would now happen was the exchange of a kidney from me to Kath. It turned out not to be so simple. I was struck with polymyalgia rheumatica after the operation. A few weeks later I suffered a stroke from a blockage in my brain. After another few months I nearly lost my sight with Giant-cell arteritis. My kidney worked very well for Kath but after 3 years cancer was diagnosed. It started as an ulcer in her mouth soon after the transplant. She then underwent a 10 hour operation and 4 weeks radio therapy. After 56 years together, I was with her when she died at 7:30 on Sunday morning, October 5 2008. Over the years we became familiar with a considerable cross section of RPAH services. We found the staff and nurses exceptionally proficient and considerate.